When Did Grandpa Hancock Get To Colorado? Tough question to answer. Here is my methodology for finding an answer. Fact #1 – What I do know – Bernard Floyd Hancock was born 18 May 1903. His mother was Lulu Pearl Brace who married Nathan Brink Hancock 19 December 1902 in Narka, Kansas. Unfortunately Nathan or “Brink” Hancock as he was called by his family and Lulu never lived together. Lulu stayed with her parents, John and Mary Phoebe “Birdie” Brace until she married John Baber in 1910 in Elbert, Colorado, which was the same year she divorced Nathan Brink Hancock. Lulu received a letter from Brink Hancock date June 21, 1904 and it was mailed from Fairbury to Narka, Kansas. Fact #2 – What I do know – The first formal record of John Brace in Colorado shows up in 1904 when John purchased land described as being three miles west of Elbert, Colorado. The 1900 census shows Johns Brace in Narka, Republic County, Kansas and the 1910 Census shows John Brace in Elbert, Colorado. One record in the Elbert paper indicates John Brace rented a house in Elbert prior to purchase of property in 1904. The 1910 census shows Lulu Pearl Brace Hancock and Bernard Hancock living in Kiowa and Bernard is shown as being 7 years old. 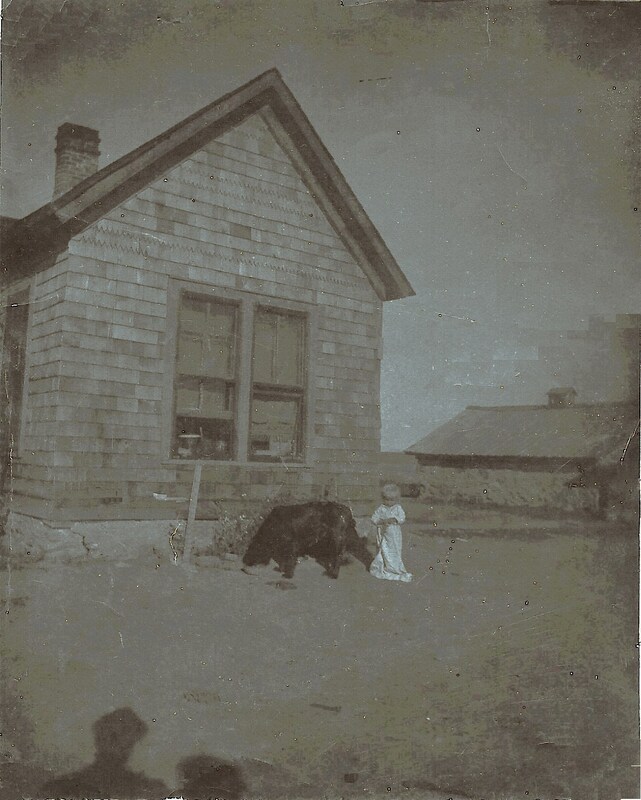 The picture below has been digitally enhanced (lightened) and shows a house with a small child and a large dog in the yard. Markings on the back of the picture indicate the child in the picture is Bernard Hancock. Based on the dates I know and the child in the picture above, which appears to be a child anywhere from 1 year old to 2 years old I would say John Brace and his wife Birdie and Lulu Brace Hancock came to Colorado in late summer or early fall in 1904 with Bernard. That would indicate the picture above would have been taken in Elbert, Colorado. If you enlarge the picture the window frames items sitting on a table. The dog may be an Irish Setter. A lot of dirt in the yard and no trees! The barn may be made of sod (very difficult to tell). 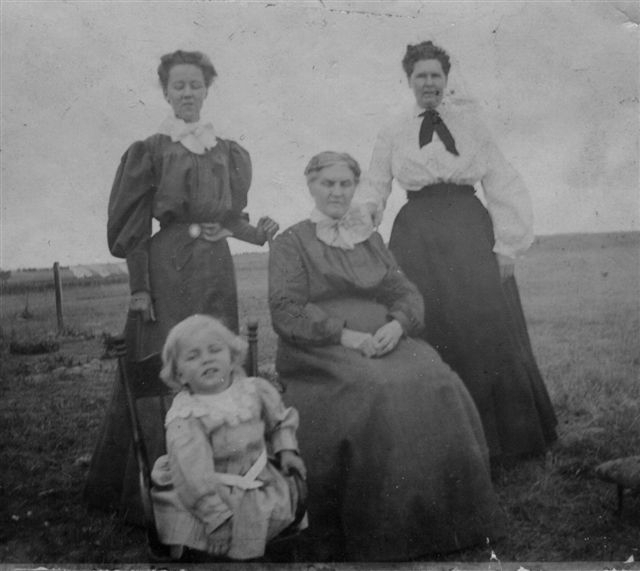 Fact #3 – What I know – Below is another picture of Bernard Hancock as a child with his mother Lulu Brace Hancock later to marry John Baber, Birdie Brace and Lois Emmerette Goodell Totten (seated) who had just become a widow following the death of her husband William Franklin Totten 11 November 1903. This picture was taken in Elbert. Another interesting point is the property where John Brace and Birdie Brace lived, described as three miles west of Elbert was just across the road from the property where Mary Francis Foreman and her parents Grace Irene Squires who married Robert Sidney Foreman, lived for a short time with Grace’s parents Edwin and Mary Selina Squires. ← The Second Time Around, Now I know!